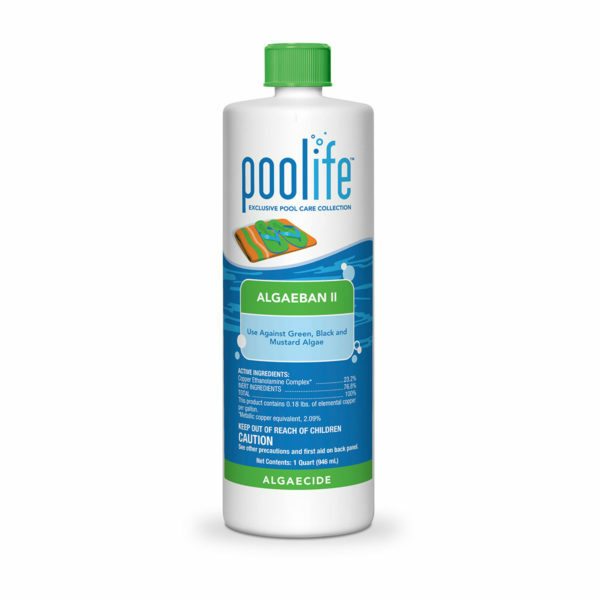 poolife® AlgaeBan II Algaecide is long-lasting and one treatment will prevent algae growth in your swimming pool for up to three months. Your pool water will sparkle like never before! Ideal for treating green, black, and mustard algae. Can be used as a preventative algaecide as well as for treating visible and severe algae growth. Preventive dose is 16 fl. oz per 10,000 gallons of swimming pool water every 90 days. Algae is no fun. It will destroy the beauty of your pool by causing cloudy, discolored water. It can even cause unpleasant odors around your pool. The poolife® brand offers an extensive range of algaecides that not only rid your pool of existing algae but prevent future algae blooms. Most of these products are non-foaming, do not require pH adjustment before use and work in 24 hours.